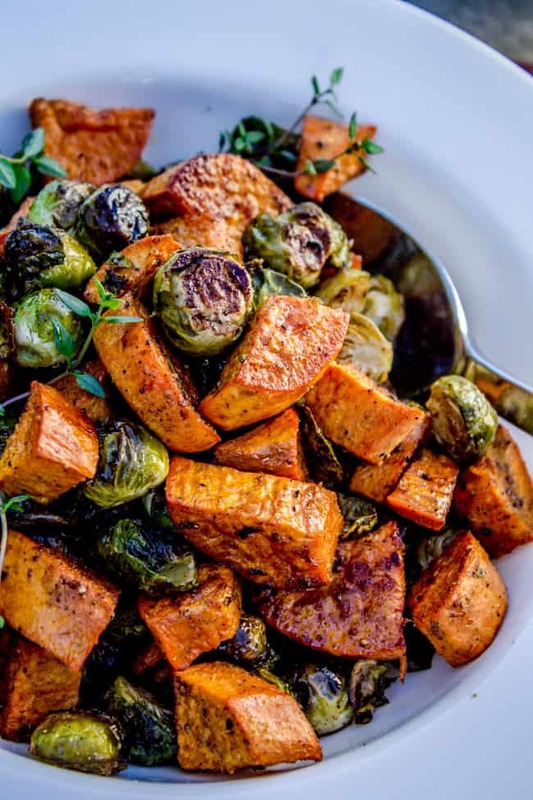 Roasted vegetables (like these Brussels sprouts and sweet potatoes) are superior in almost every way; it’s a fact. But they take up valuable oven space on holidays. Make them ahead of time and reheat! Save on time and stress. And then there were tons of comments from my extended family with things like, “worst vegetable on earth,” and “let the kids use it as a sword and then throw it in the trash!” It’s no wonder I never had them growing up. The real question is, Mom, why didn’t you buy me a Brussels sprout sword?? Wth. My brother Nate was the one who convinced me to try them a few years ago, and he said the only way you should be eating them is roasted. (And that is still the only way I have tried them.) Why mess with a good thing? They are delicious. My cousin Lani made some when they had us over for dinner several weeks ago, and she sprinkled cumin all over them before roasting. Best idea ever! I love the earthy, nutty dimension it gives the sprouts. I threw some sweet potatoes on the pan as well, and loved the combination. I wanted to see if I could make these ahead. 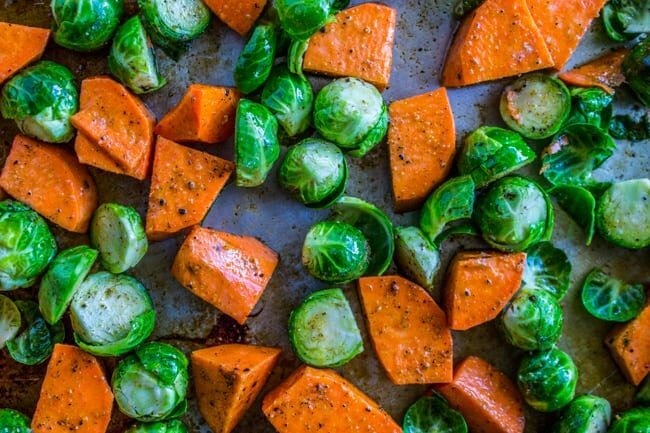 That’s the most annoying thing about roasted veggies–it’s hard to time it right, especially when your main dish (like a turkey at Thanksgiving) is in the oven. So I roasted mine, stored them in a tupperware in the fridge (for 2 days! ), and then reheated them on a pan at 400 degrees F for about 5- 10 minutes, just until sizzling and hot. It worked like a charm! This is a great way to get roasted veggies without having to worry about using your oven for 45 minutes. I was washing my pan with olive oil. P.S. If you make any of my recipes for Thanksgiving this week (or ever! ), snap a picture and share it on social using #thefoodcharlatan! I would LOVE to see what you are making! Smash 2 cloves of garlic and add it to the bowl. Pour 1/3 cup olive oil over the vegetables. Add cumin, garlic salt, salt, and pepper to taste. Stir to coat. Drizzle a little olive oil onto the sheet pan and rub it all over the pan (or foil) with your hand. Or you could spray it really well with nonstick spray. Pour the veggies onto the pan. Roast at 400 for about 30-40 minutes. The veggies are done when they are brown and a fork slides into them easily. 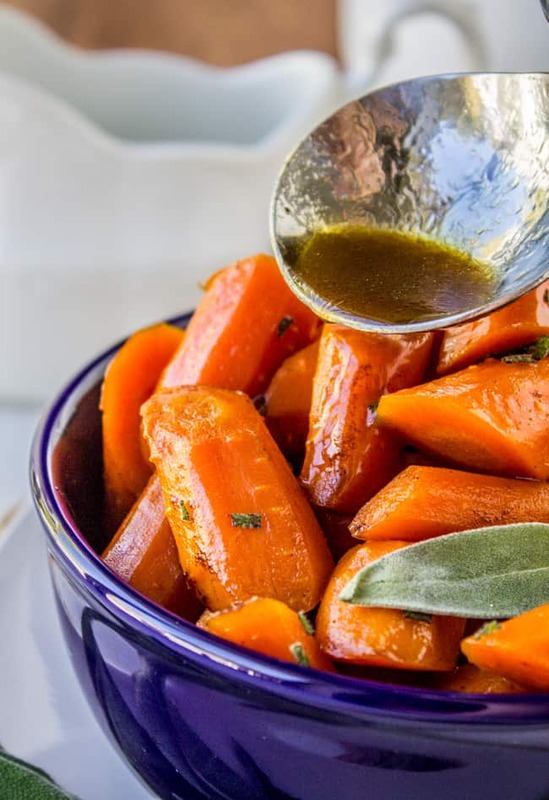 Place the veggies in a serving bowl and toss with 1-2 tablespoons red wine vinegar to taste. Garnish with fresh thyme if you want. Eat hot! The garlic is there to add flavor, not necessarily to be eaten, although I do think it's quite tasty. If you want to reheat these, take them out of the oven and let cool. (Skip adding the red wine vinegar.) Store in a tupperware in the fridge for up to 2 days. When you are ready to eat, spread the veggies on a greased pan and roast at 400 for about 5-10 minutes until you can hear them sizzling and they are hot. Remove from the oven, add a little red wine vinegar, and serve! Other amazing Brussels sprouts recipes that will rock your socks! 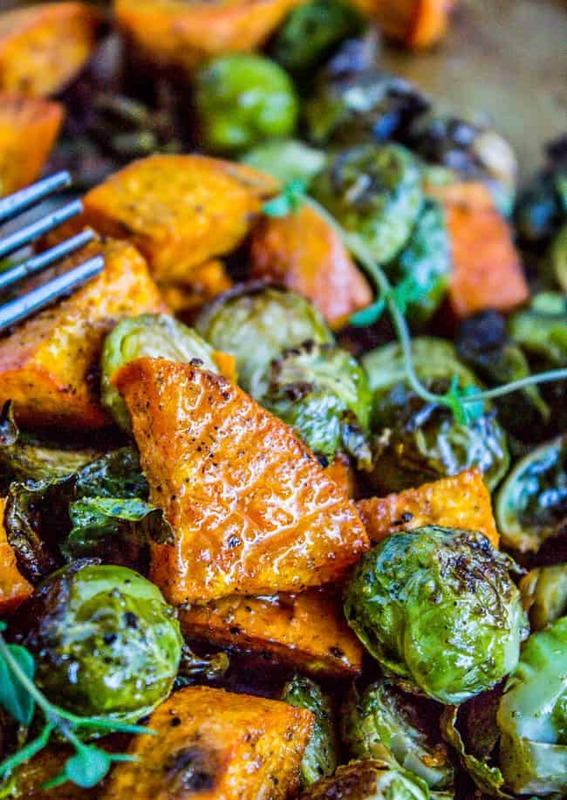 On the Stalk Roasted Brussels Sprouts from Nutmeg Nanny << No way!!! This is actually a thing!! Roasted Brussels Sprouts & Squash with Cranberries and Dijon from Blogging Over Thyme << this is my friend Laura’s recipe, and it’s one of the most popular ones on her site! Love the idea of adding salmon to this!! excellent! 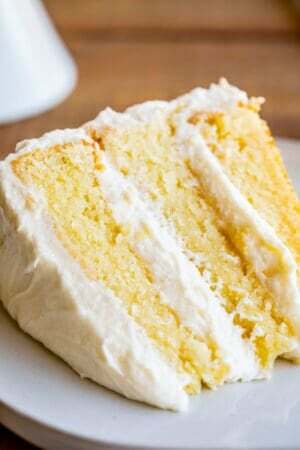 Extremely tasty and easy to make. Just had to stop by and tell you that I’ve made this recipe several times now and it is straight up delicious! And I made your roasted carrots with dill! Loving your recipes! Keep em coming! Made these last night to go with roasted chicken and they were awesome! Both the brussels sprouts and sweet potatoes were perfectly cooked and flavorful. I did line my sheet pan with non stick foil, which helped with cleanup. Thank you for the great recipe! I made this without the vinegar. Excellent dish!! Thank you! This will be the perfect recipe for the veggie side dish I need to bring for Thanksgiving. However, your story about washing your pan made this post 100 times better! Thanks Kathleen! Think of this next time you do something really stupid. haha! Enjoy the veggies! Odd as this recipe might sound…it was really good.I didn’t use quite as many brussel sprouts, maybe only 10 or so because this was only for two. However we did eat it all. It was the main part of our meal. I only added 3 or 4 slices of toasted french bread. I used balsamic vinegar because it was what I had and I put sour cream on the table for a little dollop here and there. Delicious and pretty too. Going to add beets cut in a little smaller cube next time. How could a dollop of sour cream ever be a bad idea?? Great tips Kathy, thank you! I’m glad you liked it! I’m like 99% sure this is a spam comment from a robot, but the other 1% just really wants to enter this alleged contest. I mean, do you really think I would win Johnny English?? I used frozen brussel sprouts as I couldn’t find fresh ones. This recipe is definitely a keeper. Thank you for sharing. Good to know the recipe works with frozen Sprouts JC! Thanks for sharing! Did you thaw them before roasting? Did you have to squeeze water out before roasting? 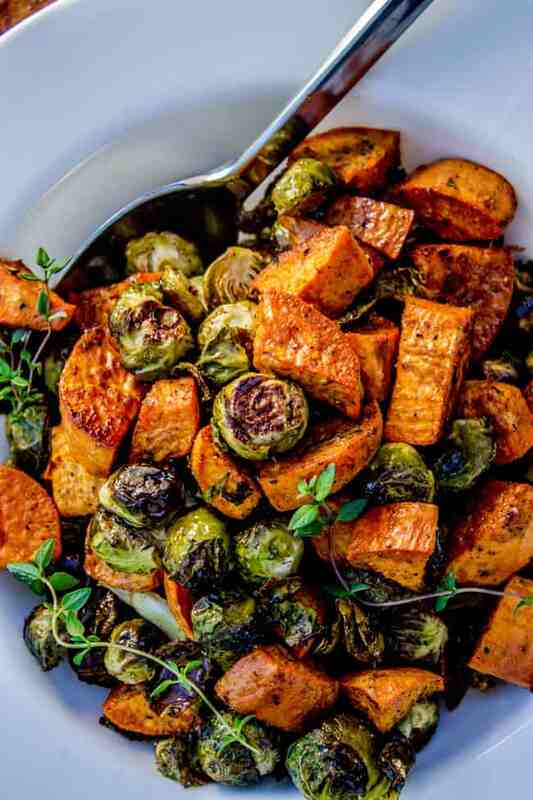 I tried your Brussels sprout with sweet potato recipe, I added more veggies too ,delishous. More veggies is always a good idea! :) Thanks Karen! I make this all the time in cooler weather you can even add left over meat ( I use left over roasts) its a one pan dinner. That’s a great idea Susan! Thanks for the tip! I’ve never made brussel sprouts before, but I’m going to make them for tomorrow’s Thanksgiving dinner. Just a little tip—cover your roasting pan with foil. Makes for an easy cleanup! Good tip Joanne, thank you!! This is gonna be my favorite roasted vegetable recipe. 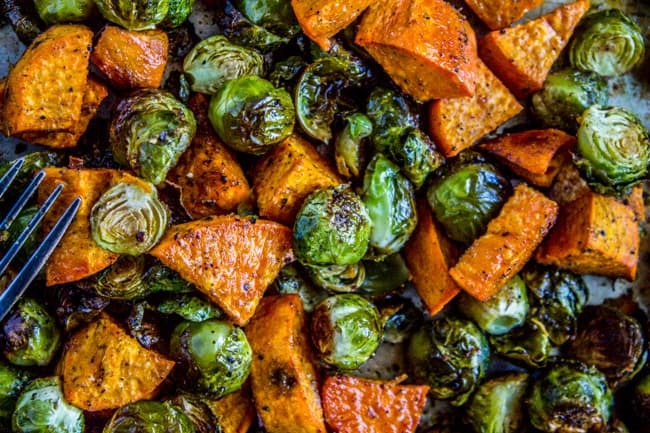 The sweet potatoes cook perfectly and who diesn’t Like roasted brussel sprouts? Awesome is one description- like candy to my husband- everyone loves them! Like candy is exactly right! My son told me the other day after I made this that Brussels Sprouts are his favorite food. Haha! Would this work with frozen Brussels sprouts? Hey Jenna! I haven’t tried it. I believe there are a few commenters who have; you might scroll through to see if you can find any feedback. Let me know how it goes! Can this be made with frozen brussel sprouts? Hey Andie, I haven’t tried it. I think there are a few commenters who have; you could try scrolling through to see if you can find any feedback. Let me know how it goes! I’m going to try your recipe right now! I love Brussels sprouts roasted with other veggies! Use some thyme, salt, olive oil – they’re yummy! Try boiling them til tender, put a little lemon or butter – you can’t go wrong! My fav – after boiling put them in a large canning jar and pour some spicy Italian dressing over them. Put them in the fridge til chilled and severe them up like pickles! Hey Bonnie! I love the idea of serving chilled Brussels sprouts as party favors! Great idea, thanks for sharing! I hope the roasted ones turned out well! This was delicious! I added parsnips, but that combination of flavorings added to the veggies was great. The last recipe I used for roasted sprouts was pretty bland, but this one was great! Lots of people are saying that they add parsnips to this recipe and I totally need to try it out! I’m a parsnips newbie. I’m so glad you liked the spice combo Mandy! Thanks for commenting! 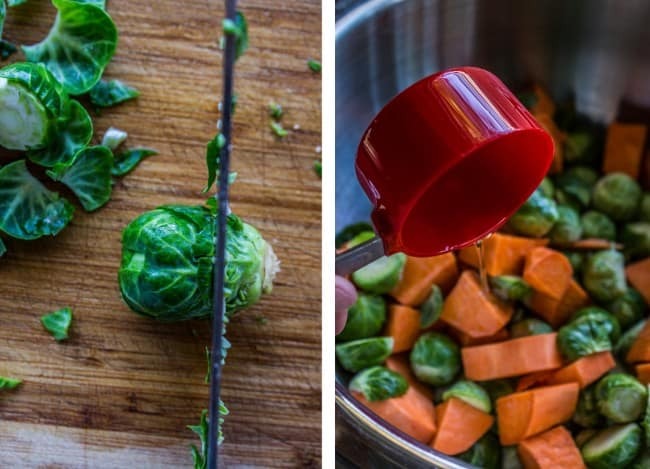 A great recipe that I’ve made several times in the last month with the brussel sprouts being in season (and the baby ones being ultra sweet). Have tweaked and added to your recipe and included a sprinkle of chilli powder and cooked with a red onion. in the last 5 mins added some fresh asparagus and broccolini to the dish so they were heated through but were still crunchy. Also served the dish as a big salad with baby spinach leaves, cucumber and tomato. So tasty and ultra healthy and a hit in the family. Thanks for the great recipe. Okay that sounds like the most AMAZING salad situation ever!!! I love it! I will have to try adding asparagus and broccolini, it sounds amazing. Thanks so much for the great idea and tips! By far my favorite recipe ever for Brussels sprouts. I’ve even ran out of sweet potatoes and made this with just sprouts and it was great! That’s awesome Crystal! I agree, it’s good even without the sweet potatoes! 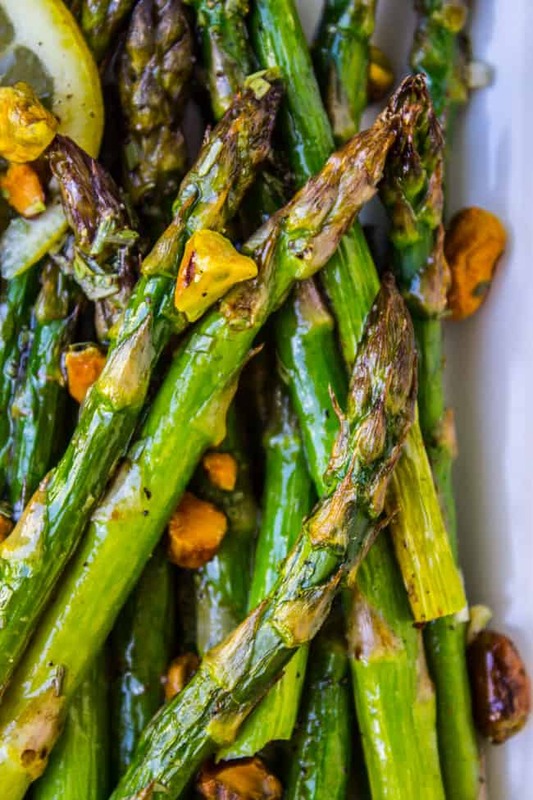 This is an incredibly delicious vegetable side dish!! A huge hit with company and so great that it can be made in advance. The only change I made was to replace the red wine vinegar with balsamic pomegranate vinegar ….. fabulous!!!! I know, I love that you can make it ahead of time! It’s the best. Also, pomegranate vinegar?? That sounds amazing! I am sooo going to try some of your recipes!!! Our company enjoyed the dish. The colors were appealing when served with a roast chicken. 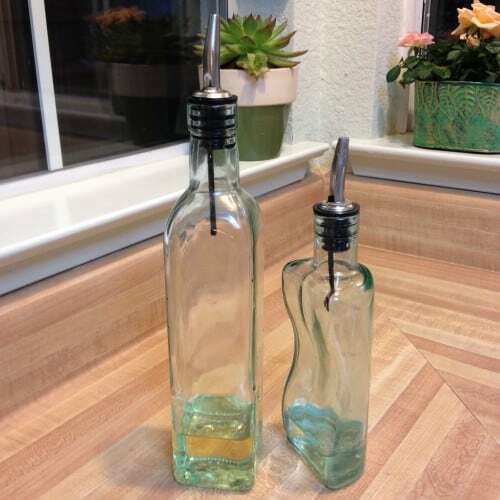 When the wine vinegar was drizzled on, the smell was a bit overwhelming–had to turn on the kitchen fan. However, the recipe was delicious as written, so don’t omit the wine vinegar. Will make it again. I’m glad it went well Carol! The vinegar is optional, but I love the little kick it adds! This really would be great with roasted chicken. Thanks for coming to leave a comment!! I made this for Easter. I am not really a lover of Brussels sprouts, but this dish was so tasty, I can’t stop talking about it. Thank you so much. Not my favorite, but only because I don’t like sweet potatoes and was looking for a new way to cook them. The brussels sprouts were great, though. Made this as a side with our ham on Easter and was delicious. The prep was simple and the thyme does add to the flavor. Thank you for sharing! Definitely making this again. Absolutely Delicious! 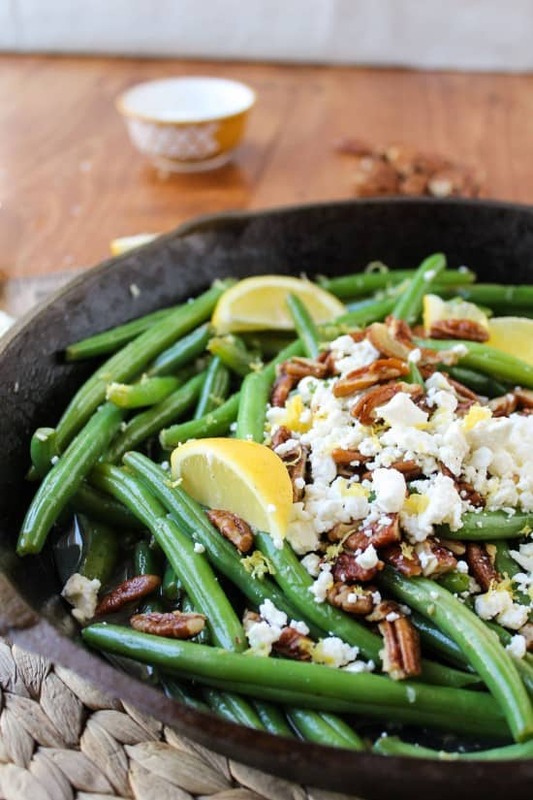 I’m on the Daniel Fast and this dish is perfect—just vegetables. I added shallot wedges to the Roasted sweet potatoes & brussels sprouts. The dish was great! Thank you. I was never a fan of Brussels sprouts. Still not a fan, but this is the only way I will eat them. I love most vegetables, but brussels sprouts and asparagus, not so much. Thank you for creating a way for me to include them in my diet. I steamed the vegetables a few minutes prior to roasting because Hubby has chewing issues. I also added a pinch of cinnamon to the other ingredients. I let them roast until they were just beginning to get a little char. Absolutely awesome! I’m so happy to hear that Jocelyn! Thanks for the comment! One of my favorite dishes to make and especially excited to add this to the holiday table because of its simplicity, healthfulness and pure deliciousness! 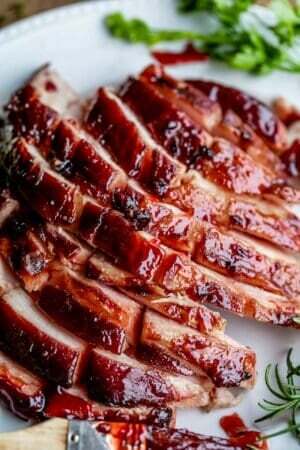 Instead of red wine vinegar I substitute balsamic vinegar and add a little tumeric. Considering adding a dash of nutmeg but may way for another day and when I don’t add cumin, which would clash with the nutmeg I think. Have shared with my weight watcher pals as a must serve! Ooh, balsamic and turmeric! Genius! Thanks for the tips! I took the chance and added dash of nutmeg. One of the few dishes with nothing leftover! I made this recipe three times — family Christmas dinner, office party and just for myself. All times I found it absolutely scrumptious. Next time I will remember to post a photo. I guess I was the odd child, because I LOVED brussel sprouts as a kid. When I moved into my first apartment, I was feeling all grown up and decided to buy some of the precooked and sauced ones that come in single serve boxes, well let’s just say that those things could turn ANYONE into a brussel sprouts hater! So I went back to making them myself. :) Your recipe looks delish! Totally gonna be trying here very shortly! Pinned and shared. Yes, you were the odd child. The rest of us could tell they smelled like feet. LOL! ;) Also I had no idea that they even made precooked presauced brussels! Sounds a little horrifying. I’m glad you came back from the dark side :) Have you gotten to try the recipe yet? I hope it turned out well! Do you turn or stir partway through the roasting in order to get the overall carmelized/roasted appearance? Hey Rebecca, no I don’t do any stirring but I’m sure you could if you want to get a really even roast! I haven’t found it to be necessary. Great question! There are some serious problems with this recipe as shown. 1. Eye appeal makes the meal. And the picture looks great. The pictures shows yams, not sweet potatoes. I used sweet potatoes as called for and was disappointed. Hey Ken, you’re totally right! I always get yams and sweet potatoes mixed up. This recipe is for yams, the orange ones. But I have to disagree on the roasting times, I think the way it’s written is perfect! :) Thanks for the comment! This looks amazing, perfect to serve with my turkey. 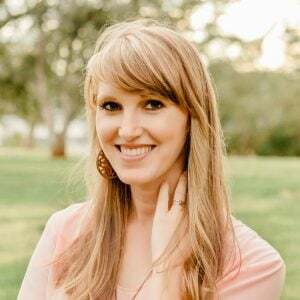 Will white wine vinager work just as well? Hey Marisol! Yes, this goes great with turkey, I agree! And yes, white wine vinegar will work great! I just found you and your recipes. I made this yesterday and it was great! Loved, loved loved this dish! So happy to hear, thanks Tekla! I made this recipe, and they turned out all burnt, this does not seem like an accurate recipe referring to the temperature and cooking time. Hey Christine! I’m sorry they didn’t work out. This is one of my most popular recipes on the site and hundreds of people have made it. I haven’t heard anyone mention their batch being burned. I suggest getting an oven thermometer to see if you oven is too high. I made this last night and it was AMAZING! It will definitely be in our regular rotation. I did have a lot that burned, though. It was mostly the leaves that were falling of the brussels sprouts. I’m not sure why that happens some times more than others. I’ll just watch it more carefully so I can pull it out of the oven sooner. Thanks again for the dish! Oh yeah that’s happened to me before when you get brussels that shed tooons of leaves. Sometimes they get perfectly chip-crispy and sometimes they get too burned. Best to either keep an eye on it or try to remove loose leaves before going in the oven if you’re not into it. Thanks for the feedback! Thank you for such a great recipe. 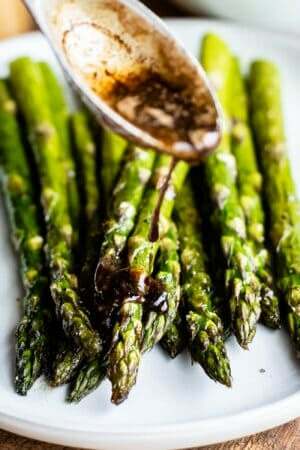 I made these and used a balsamic Vinegar Glaze. An explosion of flavor on my tastebuds. My husband has never liked Brussels sprouts UNTIL THIS RECIPE! Love it! Wooohoooo!!! Brussels Sprouts convert!! :) :) Thanks for the comment Kerry! I tried this recipe tonight with sweet potatoes and carrots and OMG they were delicious!! I will definitely be putting this in to the rotation to use on a regular basis. Can’t wait to try next time with Brussels sprouts too! This would be so great with carrots!! Good idea Jill, thanks for sharing! Thanks for your wonderful and unique recipe for brussels sprouts. 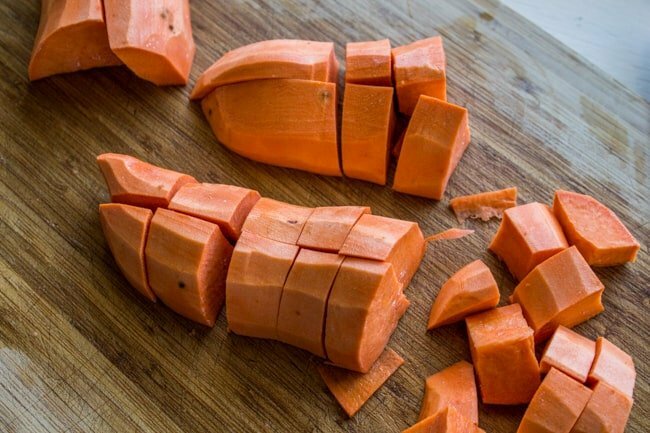 I was looking for a good way to cook mine, and I love your idea to combine them with sweet potato! I also appreciate your honesty about washing your sheet pan with olive oil. It was good for a laugh, and makes the rest of us feel “normal”. yay, I hope you enjoy the sweet potato/Brussels combo! It’s a good one. Oh and believe me, there is nothing “normal” going on over here in this house. Just below average common sense. haha! Do you think it would work if I use frozen brussel sprouts for this recipe? Hey Yii! I’ve never tried it, but scroll up a bit to see a comment from another reader about frozen brussels, I know a few people have tried it. 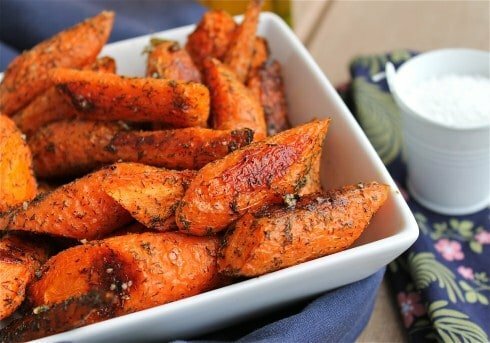 I love sweet potato and this looks delicious and easy to make. I’ve never cooked brussels sprouts before, abut I’ll give your recipe a try this week. I was going to comment where someone asked about utilizing the frozen brussels sprouts, but I don’t do FB. Thought I’d email you about it instead. For many years, I’ve been using the Bird’s Eye brussels sprouts for the Thanksgiving meal. They work extremely well and save a ton of prep time. I just make sure to microwave them about a minute less than recommended so they finish cooking in the actual dish I want to make. I love the idea of adding the sweet pots. I imagine you could also (carefully) nuke those till tender and save some time there too. Then maybe a hot pan or low broiler to roast. Maybe not ideal, but a timesaver nonetheless. I just discovered your site this weekend. I love your sense of humor. I will try this recipe this weekend. If all goes well, I might repeat it for Thanksgiving. Thanks Dia! Did you try it out yet? How’d it go? I’m glad you are enjoying the blog Titis! Thanks for reading! These look delicious! I look forward to trying them! I was wondering if I would need to make any adjustments if using butternut squash instead of sweet potatoes (cooking time, etc)? Thank you! Hey Kara! I’ve never tried it with butternut squash but that sounds delicious! I would just look up another recipe for chopped roasted squash and see how the times compare. Let me know how it goes! I made these today for a quick side dish and they were delish!! I didn’t have garlic salt so I used some Cajun seasoning and I sprinkled some brown sugar on right before I put them in the oven. Even the brussel sprout haters liked them! Cajun and brown sugar!! That sounds epic. I’m glad you liked the recipe Nia! :) Thanks for the feedback! Love this recipe. 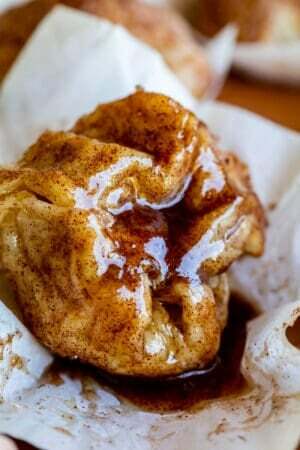 Have been looking for an alternative sweet potato recipe and as it combines two of my favorites, I thought I’d give it a try. Turned out beautifully. Will serve this one often! Hooray! So glad you enjoyed it Kimber! Thanks for the review! From what I’ve been reading 49 to 45 min is to long have you noticed that being a problem? I want to make this for Mother’s Day? Hey Laurie, sorry I missed this before Mother’s Day. How long did you end up roasting it for? 45 minutes always works for me. That’s also my concern. I normally roast brussel sprouts with other veggies for 15-20 min at 350 degrees. But I know for sweet potatoes that might not be enough so I might try roasting them separately and then mixing together. Hey Ila! It’s always worked for me as written, but everyone’s oven is different! Love the combination of flavors and the simplicity. So glad you liked it Joleen! What did you do different? I didn’t eat brussel sprouts growing up either. I made them last year I think for the first time, roasted of course, and we all loved them!! I still only roast them, I just change up the flavor combos. Haha right? Brussels sword for everyone!! Thank you Rakhee! 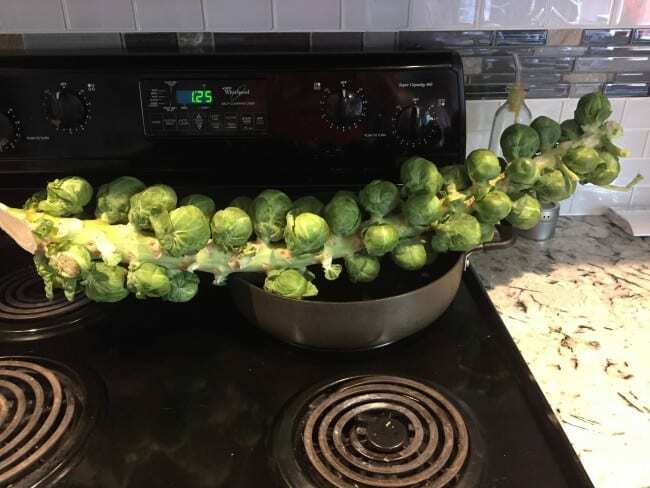 When I first saw brussels sprouts on the stalk, I was amazed- we just never really ate them growing up, either. I also used to think they were brussel sprouts, singular. The more you know, huh? I LOVEEE brussels sprouts – but only within the last maybe 5 years or so. Before that I wouldn’t try them … childhood holdover I guess! These look awesome! Happy happy thanksgiving Karen!! Hahahaha. That picture with them still on the stalk. My father hates them, so my mom never made them when I was growing up. I discovered brussels in college and fell in love immediately. It’s all in how you prepare them. Like roasted. With sweet potatoes. NICE. haha Karen about the olive oil! I love hearing these things. Makes me feel better about my own kitchen errors. The other day I decided to take the turkey carcarss from our experiement with our big ceramic grill and make stock from it. I had roasted the turkey in an aluminum roasting pan and was scraping out all the good stuff and adding water to it to get all the drippings out. When I was about done I noticed my foot was wet! So was the counter, the cabinet doors and the floor. What?? After I got it all cleaned up and hadwashed out the pan I noticed I had managed to prick a lot of holes in it while I was scraping all the good bits out water was leaking all over the place – not just plain water, but smokey, turkey drippings greasy water. Yuck! Would frozen Brussel sprouts work with this recipe also? Hey Holly! I’ve never tried it so can’t be certain. I would be nervous about the extra water making them mushy.